Made of the same materials as street signs, the 12” x 24” ---signs are durable and colorful aluminum signs have UV protective coating and anti-graffiti protection over laminate. To date we have created four Trails in Beaufort County: Chocowinity Recreation Complex sponsored by the Washington Noon Rotary and the United Way, the Boys & Girls Club in Belhaven sponsored by the Beaufort County Health Department, Oakcrest Housing Plan in Washington sponsored by Weyerhaeuser Foundation, and Chocowinity Primary School sponsored by the Carolina Panthers. The fifth Trail will be located in Beebe Memorial Park in Washington. 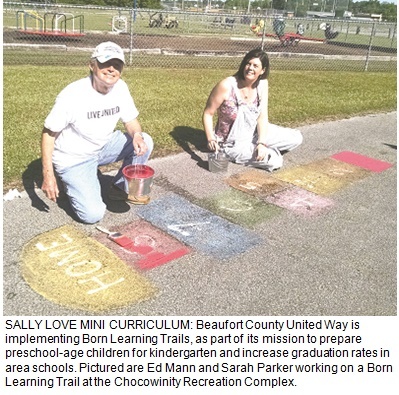 In the spring of 2017, the Beaufort County School Board voted to create a Trail in all six of their primary schools. A new United Way initiative is providing tools and education to prepare preschool-age children for Kindergarten. The nonprofit’s Born Learning Trails program targets preschoolers and their caregivers and provides the opportunity to gain skills that will prepare the children before entering school, according to Sally Love. 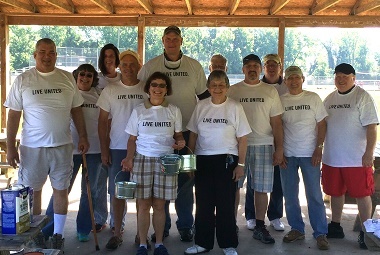 United Way Executive Director. The trails offer a series of 10 modules, accompanied by signs that instruct caregivers on how to interact with the children at each station. The modules cover a range of educational, interactive topics, including nutrition and eating healthy foods, shapes, the alphabet, shapes, numbers and others, Love said. 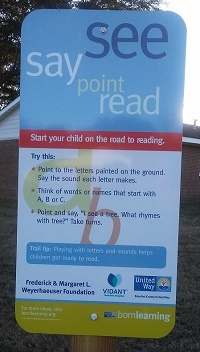 “Each module has a sign that tells caregivers how to interact with the child," Love said. "It gives suggestions for creative things to say, think about and do, for example. There's ABCs, hopscotch, numbers shapes...caregivers ask how shapes are alike, different and what do they see in nature that matches the shapes." Love said the goal is part of the United Way mission - to improve graduation rates and help children prepare for school. 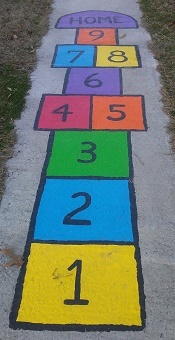 The trails teach preschool children skills that are really important for them to know before they reach Kindergarten. Love said. “Education and instilling the love of learning is key in raising the next generation for our community," Wood said. “The Washington Noon Rotary was honored to be able to support the Born Learning Trail, both financially and with our labor." Love said more trails are scheduled for construction in the near future. The trails are built to target areas such as schools, playgrounds or parks that have a high volume of traffic for young children and their caregivers. Love said the nonprofit is looking for local sponsors to help fund and build more trails. Each trail costs about $3,000 to build, according to Love. Another trail is set for construction at Oakcrest Property Management. a branch of the Washington Housing Authority where the Kaboom playground is located, pending the receipt of a grant. There is also a trail scheduled for installation at the Boys & Girls Club of Belhaven. thanks to sponsorship from the Beaufort County Health Department, according to Love.